Impala Cardboard Cutout Standup Prop - Dino Rentos Studios, INC. 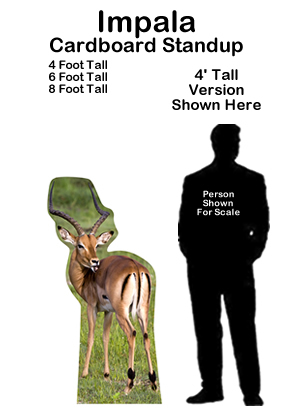 This Impala Cardboard Cutout Standup Prop is great for your animal, zoo or safari themed display or production! Get it as a self-standing piece by selecting “Self-standing” or as a hanging piece by selecting “Add Grommets”.